There seem to be a lot of subscription delivery services these days. From healthy snacks to dog treats and all points in between, whatever you fancy arriving on your doorstep once a month, there’s probably a subscription service for it. But, nothing sounds better to the folks at Hercules Moments than a box chock-full of music-related goodies (with a few oddball trinkets thrown in for good measure), tailored specifically for you. With Merchbox, that’s exactly what you get, all for $10 a month (+ shipping), or $20/about £13 if you don’t live in the US. We caught up with Merchbox guru and all-round nice fella, Mike Frankel, to find out more. Thanks for taking the time, really appreciate it! Me? I’m addicted to startups and music. What music are you currently enjoying? I’ve been listening to a lot of Motown recently. As far as new music, I created a playlist of current artists that have Manhattan neighbourhoods in their band name. Ludlow Thieves, Bowery Riots, Nolita Knights, etc. Sonically, it’s not the most strategic way to organise a playlist, but on some level, it works. I wish I could say it was something cool like London Calling from The Clash, or Rocket to Russia by The Ramones. Truth is, it was Jagged Little Pill by Alanis Morrisette. It was the ’90s, don’t judge me. Which do you prefer: MP3, CD or Vinyl? Artwork is a huge part of the music experience, and I think vinyl highlights that. It’s a completely inconvenient medium though. I think CDs are a great way to discover new music because they’re relatively convenient, and still provide a visual experience. We love the idea of Merchbox over here at Hercules Moments. How did Merchbox start? Where did you get the idea from? I ended up in a college dorm a few months ago (don’t ask), and noticed how different it looked from when I was in school (which wasn’t too long ago). There were no posters on the wall, CDs on the shelves, books on the desk. No stuff. It was sterile. Everything needed was on a laptop or phone. Definitely convenient, but kind of boring. I came up with Merchbox as a way to get tangible entertainment back into people’s lives. You also run FreeIndie with your friend Alex, so you must be a pretty busy guy. How many of you work on Merchbox? Yeah, and I also help run Wreckroom Records. Very busy. I have two other people who help out with Merchbox. The reason I’m able to do so much is because of my great team. Could you tell us a bit more about Wreckroom Records? Wreckroom is a singles label. Each week we team up with an up-and-coming artist, produce a studio track, film a live video, and then put it up online for people to enjoy. We have an awesome team – the label was founded by Adrian Grenier, and includes Giraffes guitarist Damien Paris, and an incredible young gun engineer, Brian Koerber. Really proud of what we’ve done there. Looking at some of the Merchbox on Tumblr, there seems to be quite an eclectic mix of goodies you throw in there. Could you describe what goes into the average Merchbox? 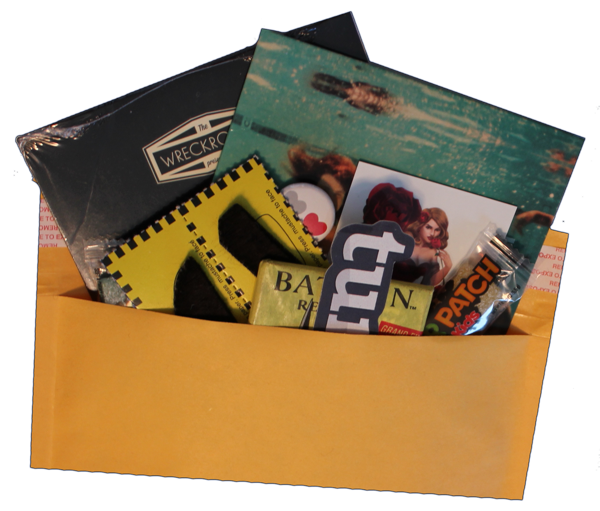 If you like getting presents and discovering new artists, just imagine what an ideal package would look like. That’s a typical Merchbox. Where do you get the items from? Some of those knick-knacks look hard to source. Very hard to source, but that’s part of the fun. We love to throw in some vintage throwback items, and finding those in bulk is tough. However, they’re out there. What advice would you give to someone who wants to start up a service like yours? Don’t. I don’t want any competitors. Makes my life harder. Finally, what would go into your ideal Merchbox? Good question. A vinyl David Bowie album, a CD from an awesome band I’ve never heard of before, a Clash button, and a piece of the wall from CBGBs. So if you fancy receiving some Merchbox goodies in the post, get yourselves signed up here. N.B. Pieces of walls not included (probably). –Originally posted on Hercules Moments.